Engaged in the manafacture of tenpin settlers for bowling alleys, Bernard A. Ball headed one of the large producers of these materials, centering his activities in Smethport and shipping his setters to all parts of the United States. The company that he heads employs thirty persons, has four trucks, and keeps its own private railroad siding on the Pittsburgh, Shawmut & Northern Railroad. The firm was originally a lumber establishment, and, continuing this work today, is recognized as a leading lumber and building supply house. Olean public schools furnished Bernard A. Ball's early education, and after he completed his high school studies he came to the firm of Holmes & Gilfillan, lumber dealers, in Smethport, to begin his business career. That was in 1912. Since that time he has remained with the organization and has had much to do with the promotion of its best interests. No record of his career would be complete except against the background of the company's history, with which he has been so intimately concerned in recent years. The firm was founded March 1, 1894, by F.L. Holmes and Alba J. Gilfillan, as a retail and wholesale lumber establishment. They were also sales agents for the American Extract Company. Mr. Holmes was at that time in charge of the office, and Mr. Gilfillan went on the road as a sales representative. The firm was housed in a building at Mechanic and Water streets, Smethport, where the plant is still situated. In 1933, Mr. Ball succeeded to the office after Mr. Gilfillan and Mr. Holmes both passed away over the past year. In 1936 Mr. Ball bought the interests of the estate and liquidated the corporation, reorganizing it as his own firm and operation it thereafter as the Holmes & Gilfillan Company, with himself as owner and proprietor. In 1939 he designed the Spot-o-Matic pin-setter, which he manufactured after that time instead of the old Backus pin-setter. Mr. Ball took a lively interest in community affairs, being a director of the Grange National Bank, a director of the McKean County Motor Club, and a member of the Conopus Club and the Rotary Club. In the Benevolent and Protective Order of Elks he belonged to Bradford Lodge, No. 234, and was also a member of McKean Lodge, No. 388, Free and Accepted Masons. He was a charter member of the Billiard and Bowling Institute of America. 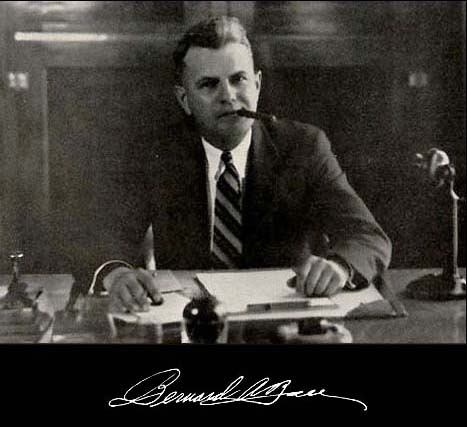 Bernard was also a Republican in politics, and saw military service as a soldier in the World War in 1917 and 1918. Bernard A. Ball married, February 7,1918, Jennie Kohn, of Smethport, daughter of Carl Kohn. They had one son, Bernard K. Ball who went Smethport school and now has children and grandchildren in Smethport.